I found myself in a dilemma. I needed to get a long run in with a tempo somehow. Benjamin needed to get a long tempo in. Sarah is 27 weeks pregnant and cannot run uphill, so she needs to start her run in the canyon. Benjamin has a cold and his hip is still not 100%. We have a 5 K (Murray Fun Days) coming up on Monday. Little boys need to run as well. Somehow I managed to find a solution that addressed all of the issues this morning. Benjamin and I took Sarah to Canyon Glen Park. She ran home from there. We warmed-up 3.45 to the magic mark above Vivian Park and then did 8 mile tempo to the house. I carried a bottle with Emergen-C as I thought if he carried it it would mess up his already messed up form even more and we stopped religiously for Benjamin to take a few sips and stretch at the end of every mile. Benjamin was able to get through the run without major issues and finished strong gapping me by 10 seconds over the last 0.2 on the hill. He averaged 5:42 for the whole run, I got 5:43.5 average. Then I ran back 4.7 to the car with Joseph and Jacob - we also stopped every mile for Emergen-C and to massage Joseph's legs. So I managed to get in 16 miles today with 8 of it at a tempo pace. Benjamin got in 11.5. Jenny and Julia ran with William and Stephen - usual distances. 8 mile tempo with Benjamin. Today Joseph and Jacob did a 500 time trial on the track. Joseph got 1:34.6, Jacob 1:35.7, splits were Joseph - 17,18,20,20,19. Jacob - 17,19,21,19,19. Benjamin did 8, William 3, Stephen 2, Joseph and Jacob 5, Julia 3, Jenny 4, Matthew 0.25. Warm up with Benjamin, Joseph, Jacob, William, and Stephen, plus Matthew and Mary in the stroller. Day of rest. Went to church. It was a Fast Sunday. Took a nap in the afternoon. We had Sarah's family over for dinner in the evening. A lot of people, in addition to our family and Benjamin's friend Grant who is living with us, we had 26 people if I counted right. Murray Fun Days 5 K, 17:54 officially, 17:51.4 on my watch, 8th overall, 3rd master. The reason for the difference of 3 seconds is the mess up at the start. The start was very uncertain, so the timer was started before they told the runners in no uncertain terms that they should actually start. Runners ahead of me - Anthony Costales won with 15:36, then Teren Jameson 16:14, Ken Richardson 16:29, Benjamin 16:42 officially (16:40 on his watch), Albert Wint 17:11, Matthew Wolpert 17:36 (1st master), Mark Payne 17:51 officially, 17:48 on his watch, consistent difference with mine). I ran with Mark most of the way. The first mile was 5:36 (uphill), second 5:38 (small part uphill, the rest downhill), and then 6:37 for 3.107, 5:58.7 pace for the rest of it on rolling hills. Matthew passed us around the 4 K mark, neither of us could latch on, but Mark gapped me there and I could not close it. My legs felt shaky after the run, so it appears that the issue was the lack of leg strength. I am happy with the first 2 miles, but not with the last one. I told Benjamin to start conservatively as an experiment to see if he could close strong. He started perhaps too conservatively, and he could not close super strong either, although perhaps it was not too bad for the heat and the hills. So 5:34, 5:11, and 5:55 for the last 1.107, so 5:20.7 pace. He was closing on Ken but ran out of road. Do not know if he would have been faster with a faster start. The conditions were warm as usual. We cooled down with a new friend - Kenny "The Apache" Searle who blogs here as well. Later I ran with Joseph and Jacob in the canyon. Cool-down with Benjamin and Kenny. Did a workout with Benjamin with Draper Days 5 K in mind. First 3 mile tempo run in the canyon with the first 0.75 uphill, then 180 turn, 1.5 downhill, 180 turn, and 0.75 uphill. I ran the splits of (up) 88,88,91,(down) 84,83,83,84,86,86,(up)93,90,89 - total 17.25.7. Benjamin paced me through the first 1.5, then ran (down) 73,75,78, (up) 92, 88, 84 - 16:47 total. Benjamin experienced an odd loss of power. First he was clumsy on the turnaround - his first post-180 100 was 25 seconds. Then something happened in his last 100 - it was 24 seconds. He thought the problem was of neurological nature - he did not feel his breathing was being taxed. Then we did 4 x 0.25, 3 up, 1 down with long recoveries (0.25 jog). This time Benjamin felt no neurological problems - (up) 68.7, 66.3, 66.5, (down) 59.7. I got (up) 78.8, 77.9, 76.5, (down) 70.2. Then we cooled down, and I ran 4 more with Joseph and Jacob. I was hoping for a leisurely cool-down, but they made me work. Today we did our race with the handicap. Joseph and Jacob did the 800, William 700, Stephen 600. All started at the same time. I paced Stephen, Benjamin paced William. William ran 2:39.7, Joseph 2:43, Jacob 2:45, Stephen 2:50. Stephen's splits were 49, 58, 63. He really fell apart in the last 200. But he was first at the 200 to go mark, for which he got two stars. William caught him with 150 to go. His splits were 88 for the first lap, then 46 for the next 200, and 25 for the last 100. Aside from the last 100 he had a good run - if he could run another 100 as slow as 27 that would give him 3:07 - a big PR. I think with some conditioning and stars aligning he could get under 3:00 at the nationals. Joseph and Jacob were tired, so I had them just jog back home and not do any more miles today. Benjamin and I did a total of 10, Jenny 6, Julia 4, Matthew 0.25. Stephen a bit over 2 miles total. Did 600 on the track with Joseph and Jacob. Wanted to see if yesterday was a fluke, or maybe indicative of some fatigue. They both did better - Joseph got 1:58, Jacob 1:59. One concern I had was that they dropped back when I moved forward at 300 to make sure they stayed on pace, and they did not close that gap. So maybe there is some lingering fatigue involved. Jacob said he was feeling good, but did not have the motivation to move out into the second lane to pass Joseph. Joseph said he did not think he had another gear. So I think we will repeat this workout on Monday. At first I had Benjamin pace them because I needed to go to bathroom and there was not one around. After he took them through the first 100 in 40 I stopped them and had them try again. Then I felt I would be able to pace, so I did it instead. The first 200 was 38 and we were all together, maybe Jacob had 39, then I was 77 at 400, Joseph 78, and Jacob 79. About 50 meters before the finish I took my foot of the gas because the gap was too big to be productive, but I still ended up finishing maybe a second or so ahead of Joseph. William did 2, Jacob and Joseph 4, Benjamin and I 10, Stephen 1, Matthew will run 0.25 tonight, Jenny 5, Julia 4. Warm-up with Benjamin, Joseph, Jacob, William, and Matthew and Mary in the stroller. 600 with Joseph and Jacob. Total of 20. Started with 4 before anybody was awake, then drove to the Canyon Glen Park with Sarah, Grant, and Benjamin. Sarah ran home, Grant rode the bike and provided drinks/food for us on the go (EmergenC, fruit snacks). Benjamin and I did an 8 mile tempo from the magic spot near Vivian Park to the house. Benjamin was able to run without stops today. Our first 5 miles were 29:10 at a fairly even pace, then I told Benjamin to pick it up. He ran the last 3 (1 down, 1 rolling down, 1 up) in 16:32 (5:25, then 11:07 for the last 2 fairly even), total time 45:42. I got 17:39 (5:42,5:55,6:02), total time 46:39. I was happy to see that Benjamin is regaining fitness and health. Afterwards I ran 4.69 with Joseph and Jacob to retrieve the car. With Benjamin and Grant - warm-up/distance. Total of 10. Benjamin did 10, Jenny 6, Julia 4, Joseph 2 (sore throat), Jacob 3 (gave him a break as well), William 2, Stephen 1. Did a workout with Benjamin, more or less the same one as last week. 3 mile tempo on an out and back course with two 180s with 0.75 up, 1.5 down, and 0.75 up in the canyon + 4x0.25 except this time 2 up followed by 2 down. Benjamin paced me through the first 1.5 then took off. The splits were 86,87,89,82(5:44),82,82, then Benjamin 3:34 for the next 0.75 down followed by 87,80,79, myself 85, then 2:50 for 0.5, 93,90,88 - Benjamin 16:09, myself 17:14 - improvement over last week. Then we ran the quarters, two up, and two down. I got 77.5, 78.7, 70.6, 69.8. Benjamin had 67,68,61,59.7. I had Joseph and Jacob run a bit less today again to help them be fresh for Draper Days. We took the van to get checked at a car shop and then ran back. From the car shop with Joseph and Jacob. Ran 10 alone today because I had to get to the OpenWest conference. Ran into Curtis Eppley who was celebrating his 50th birthday by running 50 K. He was moving at a good pace up the canyon and caught up to me. We ran together at about 7:00 pace which is very respectable if you are going up the canyon. Gave two presentations at OpenWest, then participated in the Capture the Flag competition. It was very tempting to stay up late solving the problems when I got home, but I knew Draper Days was coming up, so I made sure to get to bed on time. Kids ran their usual distances - Benjamin ran with Joseph and Jacob. Did a small taper for Draper Days - only 8 miles today. Benjamin did 8, Joseph and Jacob did 3, Jenny and Julia 3 as well, William 2, Stephen 1, Matthew 0.25. Draper Days 5 K, 17:17, 13th overall, 4th master. We did our family time challenge. Same crew as last year - myself (17:17), Sarah (29:50), Benjamin(15:56), Jenny(21:10), Julia(22:36), Joseph(19:10), Jacob(19:19), William(22:20). Average of 20:57. Those who are not pregnant (that is everybody except Sarah) averaged 19:41. Dad and boys averaged 18:48, Mom and girls got 24:32. All the kids ran a PR (for Benjamin, road PR, other kids have never raced a 5000 on the track). I was off master's PR by 3 seconds, but got the fastest time in 2 years. Sarah ran an advanced pregnancy PR, which is quite remarkable as she has run consistently for the last 16 years, so her PRs were not that far off her potential, she is 40 years old, and is 28 weeks pregnant with our tenth child. Even though I was aware of her fitness I was pleasantly surprised with how well she did. I opened with 5:28 (uphill), second mile was 5:29 (downhill), then 13:45 at 4 K. Last 1.107 uphill was 6:20 (5:43 pace). I followed Matt Wolpert and Graig Green for the first 0.75 or so, then they surged, and I knew it was too fast, so I backed off and ran with Mark and Dan. Dan dropped back around 1.5, Mark took the lead shortly before 2, I tried to hang on. I thought he would drop me earlier, he almost did around 4 K, but I regrouped and closed the gap. However, with a quarter to go I just did not have another gear. I felt like I lacked a few nanograms of testosterone to be competitive in that last quarter. Nevertheless I improved from last year, and was only 3 seconds slower than my master's PR. I am very happy about this improvement. Mark ran a great race - a new PR. Benjamin appears to be on the mend. He was able to improve his last year's time by a little bit. His start was sluggish - 5:09, but then he shifted gears and was able to run 4:53. In the last mile he lost the steam, but still managed 5:54 for the last 1.107 uphill, which is 5:19 pace. He let go of Ken from the start, closed a little bit, but then I think let go again. Joseph and Jacob started out too slow - 6:20, then shifted gears and ran 5:54 on the downhill mile, but then both ran out of steam - Joseph less than Jacob. At 4 K Joseph had 15:20, Jacob 15:21, then last 1 K was 3:50 for Joseph, 3:58 for Jacob. Last 1.107 - Joseph 6:56 (6:15 pace), Jacob 7:05 (6:23 pace). Jenny got to 2 miles in 13:32 (6:48,6:44), and then ran the last 1.107 in 7:38 (6:53 pace). So she had very even effort. Her time of 21:10 is the new Pachev family women's record. William's and Julia's splits are unknown because they did not have a watch. Julia was ahead for about 2 miles, then William passed her. Both got PRs, though - Julia by 18 seconds, William by 55 seconds. Julia set a family record for girls 13 and under. Sarah opened in 9:33, then 9:30 on the downhill, and 10:47 for the last 1.107 (9:44 pace). Her split at 5 K was 23:53, so 5:57 for the last 1 K.
Sarah set a new virtual pregnancy standard. 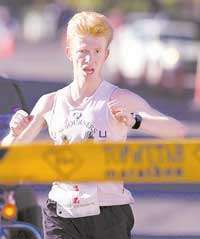 Now anybody who cannot break 29:50 in a 5 K is virtually pregnant - in the third trimester and with the tenth child too! Back to meet Sarah and finish with her. Distance with Benjamin, Steve, and Jake Larsen. Mark Payne and Craig Green joined us for part of it. Today Stephen got a new mile record - finally after many failed attempts - 8:12.3 on the "little boy" course. He started out, but was not going the right pace and complained his leg was hurting. At 0.55 I gave him a choice to jog back home and get nothing, or to stop, jog back to the 0.5 mark, run the time trial with prizes attached for a good performance, then jog 0.5 back home. He chose to try again. His splits were 1:57 (slight down), 1:58 (slight down), 2:16 (slight up), and 2:01 (slight up). Jacob and Benjamin did 2 miles with Stephen. William ran 1, Joseph 3, Jenny, Julia, and Matthew their usual distances. Benjamin and I did a total of 10. Kids are tapering for the USATF Nationals. Drove to Sacramento today. Did some running on the road, the rest of it late in the evening when we got there. The weather during the day was extremely hot - 105F, and at night it was still hot, although runnable. In Wells, NV - with Stephen. Wells, NV - Joined Benjamin, William, and Jacob for the rest of their run. Lovelock, NV - with Benjamin, William, Joseph, and Jacob. Lovelock, NV - with Stephen, Benjamin, Joseph and Jacob. I think this one was with Stephen in Sacramento. Today William and Jacob raced the 800 at the USATF JO Nationals. William ran 3:07.96 taking 40th place which is a 4 second PR. He opened with 41, then had an official split of 88.36 at 400, not sure what he had at 600, but his last lap was 1:39.60. The temperature was around 90F. I was concerned he might have problems - both mental and physical, but 1:39 last lap was as bad as it got - I was happy we got away so easy. I do not know why they do hurdles before the 800s. The video of William's race can be found here . The slowest final qualifier in William's division (7-8) ran 2:43.49. Jacob ran 2:38.04 finishing 21st in the 9-10 division. The slowest final qualifier in his division ran 2:29.06. For his race it was even hotter - I think around 98F. Fortunately we developed a good cooling strategy for both Jacob and William - keep them in the van with AC on until the very last moment, then use a pack of ice and a water bottle with ice water while waiting for the race to start at the stadium. Unfortunately they make you wait at the stadium for a long time and they separate the children from coaches and parents while waiting. Jacob opened with 36, then had an official split of 77.67 at 400, and ran the last lap in 80.37. This was a new race PR - he had run 2:37.7 in a time trial. But considering the heat, this was a PR effort. Jacob's video is here. There was some drama in that race - he was with Elijah Hughes, who has a 400 PR of 64 seconds and 800 of 2:31 with 100 meters to go. Jacob's 400 PR is 72.7, so you would think he would have no hope in the kick. Somehow he managed a kick and ended up edging Elijah by 16 milliseconds at the finish. In another bit of drama, Tillman Bartholomew, who beat Jacob in the regionals, was in the same heat. Tillman used the same strategy that worked in the regional race - sit behind in the first lap, then move forward and try to pull away. Except this time it did not work. Jacob kicked with 300 to go and pulled ahead. Ironically, they pretty much traded times - Tillman ran 2:43, just like Jacob in the regionals, and Jacob was a second and a half faster than Tillman's time at the regionals. Benjamin did 6, Jenny ran 5 at home, Julia 3, Joseph 2, Jacob around 4 and William around 3, I think. Errands at the race venue. With Stephen, Julia, Jacob, and William. I think this was with Jacob and Julia. 10 for me, Benjamin did 6, Joseph 2, Jacob 4, Julia 3, William 2, Stephen 1, Matthew 0.25. Benjamin and I did 2x0.21 pickups. Benjamin was concerned that it felt harder than it should have. I validated the length of the stretch by running it several times back and forth and comparing the splits to the pace over a longer stretch using Google Maps. From that I estimated the stretch to be around 0.21. My take from that as well as his recent races and workouts was that he needs to be more aggressive at the start. With Benjamin, Joseph, Jacob, and William. Julia and Stephen joined us for the first 0.57. With Benjamin, Julia, and Jacob. With Benjamin - we did 2x0.21 pickups. Today Benjamin raced in the 3000. He got 3rd place in 17-18 division with 8:53.73. This was a significant moment in our family history. I have wanted to break 9:00 in 3000 on the track, but never could. As a teenager I thought of 9:00 as a standard of excellence. While I could not achieve that, Benjamin did today. The video of the race is available here. By 1 K - 2:53, 3:01, 2:59, so quite solid. From the start Benjamin let Hunter Lucas go, which perhaps was correct, as I do not think he would have lived through a 4:31 opening 1600, and battled back and forth with Alexander Hirsch with Patrick Sicurello on their tail a couple of seconds back for most of the race. Alexander passed Benjamin shortly before 400 to go and gapped him a bit. Patrick passed him with 200 to go, but Benjamin shifted gears in the last 100 and regained his position as third. He did not catch Alexander, though. Additionally, in order to be third, he had to beat Nic Caruso's time from the second heat. Nic had a slow mark of 9:31 due to bronchitis and was thus put in a slower second heat, but he is an 8:46 guy. He was still not 100% at the race, but he managed to run 8:54 solo. Benjamin did beat that thanks to the final push and ended up third after Hunter Lucas (8:45), and Alexander Hirsch (8:52). Running wise, we did what we could - Benjamin and I got in 10 miles, other kids expect Joseph ran their usual distances. Joseph did only 2 as he was racing the next day. With Joseph, Jacob, and William at the Hornet Stadium. With Jacob at the Hornet Stadium. With Julia, Jacob, Benjamin, and Stephen. Today Joseph raced 3000 meters. He got 10:55.76 finishing 27th overall and 5th in his heat(there were two, he was in the slow one). I recorded his splits with Fast Running Friend, see below. By 1 K his splits were 3:37, 3:41, 3:37. The race video is here. Running wise we ran whenever we could. Benjamin and I ran 3 in the morning, then added some more at the track with Jacob and William, then ran while travelling around gas stations, and ran some more once we got home. With Benjamin in Sacramento at our rented house. With Benjamin, Jacob, and William. Jogging around at the track to find Joseph. On the road with the kids - Stephen, William, Joseph, Jacob, and Benjamin. With Benjamin, Jacob, Joseph, and Julia.